A: Select - Swipe - Return. Browse through the movie inventory. Select the title you want to rent. Select Buy or Rent. Swipe your credit card and take your movie. To return a rented DVD, press Return, wait till the screen prompts you to place the DVD in the return slot. Q: What are Promo Codes and how are they used? A: A Promo Code is a discount on a movie rental. To use a Promo Code, browse through the movies. Select the title you want to rent. Select Rent. Before you swipe your credit card you will see an option to enter a coupon code. Press the coupon code button and enter your code. Swipe your credit card and take your movie. 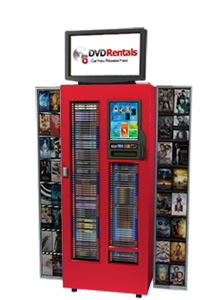 The coupon code will be applied when you return the DVD back into the kiosk and the value of the coupon will be removed from your rental total. Q: How do I get a Promo Code? Like us on facebook www.facebook.com/jetflix and look out for promo codes. Q: When are the movies updated? A: The new releases are updated every Tuesday on Oahu and weekly on the outer islands. Q: How do I pay for renting a movie? A: The machine accumulates charges PER NIGHT, PER DVD, plus tax. Your credit or check card is charged when you return the movie. Q: How many movies can I have out at the same time? A: You can rent up to 3 DVDs at the same time on one credit card. Q. What is the deadline for returns? A: Movies are due at 9 p.m. the following day. You have up to 17 days to return your movie. For Molokai customers, movies are due at 8:00 p.m. the following day and you have up to 12 days to return your movie. If you do not return the movie, the credit card that you rented the movie with will be automatically charged the listed selling price of the DVD. $25 plus tax for DVDs, $35 plus tax for blu-ray. Q: Do I need to return the DVD to the same kiosk that I rented from? A: You can return to any Jet Flix DVD kiosk. Please see About Us for our locations. Q: What will happen if I lose the movie? A: If you lose a movie, please contact Customer Service. For a lost movie, the credit card that you rented the movie with will be automatically charged the listed selling price on the 17th day the movie is checked out (on the 12th day for Molokai customers). Q: What do I do if the DVD I rented is scratched or does not work? A: Please call Customer Service. You will not be charged. Please call during regular business hours from 10a.m. to 7:30 p.m. or you can email us at jetflixrentals@gmail.com and leave us your name and number so we can contact you. Tip: DVDs can stop working if there is dirt or grease on the playing service. Most often, you can wipe the dirt or grease from the DVD with a soft cloth and it will work again. Q: Is my credit card information safe? What type of security protects my credit card information? A: We use the most secure method available for transactions and all communications use 128-bit encryption. Your credit card information is not stored on the kiosk computer system. All our kiosks meet the PCI DSS Compliance requirements. Q: Does the kiosk issue receipts? Q: I can't find the answer to my question... what now?